For the last 13 Years Renata has worked for many top-class Hotels and restaurants in Europe after recieving her masters degree in catering, specializing in Pastry Design. 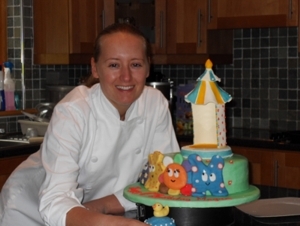 To-date she has made thousands of clients happy with Her desserts and cakes. ons and after achieving a very high personal degree of expertise in pastry design she decided to start up her own business specialising in designer cakes for the Irish and European market. She has always wanted to add her artistic talent into her creations, and the best way to show this is to prepare cakes for special days .i.e. Weddings, birthdays etc. personally designed based on the clients wishes. Her favourite clients are those that do not have to say a word when presented with one of her designs, the expresion on their faces say it all - The Kids... Renata especially likes to design a cake out of your kid's favourite toy and it is a very special talent she has when it comes to desiging your Wedding Cake. The challenge to match the wedding cake to the bride's dress and wedding party, flowers and the ballroom design, colours and decoration are a unique talent to which Renata excells at. www.noveltycake.ie specializes in hand-sculpted personalised pastry works of art. Clients are passionate about our cakes for both their artistic designs and their unique personalised taste. Each cake is created completely with you the client in mind and is not started untill both designer and client are 100% happy. This truly gives the design its own personal touch and is guaranteed to be a one off design. Renata only uses the freshest ingredients. www.noveltycake.ie offers a variety of fantastic cake flavours to suit every palate.